Amid the chaos of a second papal interview's sudden release, it was a moment of history this morning as the newly-formed "Council of Cardinals" convened to begin its first three-day meeting in the Pope's private library in the Apostolic Palace. Clockwise from Francis are the members: Cardinals Seán O'Malley OFM Cap. of Boston, the emeritus of Santiago de Chile Francisco Javier Errázuriz, Oswald Gracias of Bombay, the "Mayor" of Vatican City Giuseppe Bertello; in violet the group's secretary, Bishop Marcelo Semeraro of Albano and, up the other side, Cardinals Reinhard Marx of Munich, Laurent Monsengwo Pasinya of Kinshasa, George Pell of Sydney and the coordinator of the project, Óscar Rodríguez Maradiaga SDB of Tegucigalpa. 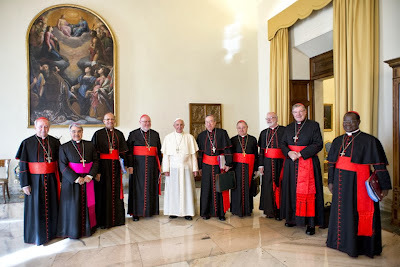 Entrusted with the open-ended mandate of advising the Pope "in the governance of the universal church" with a particular emphasis on the reform of the Roman Curia, in his interview today with La Reppublica Francis said his choices to comprise the body were "not courtiers but wise and animated people of the same leanings as mine. Calling the group "my council," Francis declared that its convocation marked "the beginning of a church with an organization [that's] not only vertical but also horizontal." Before heading to the former papal residence that Papa Bergoglio now employs as his daytime office, the Council – announced by Francis in April, but only established formally yesterday – served as lead concelebrants with the pontiff at this morning's usual Mass, at which he prayed in their name "that our work today will make us all more humble, more meek, more patient, more trusting in God, so that the church can give a beautiful witness to the people, and seeing the People of God, seeing the church, they might feel the desire to come with us." 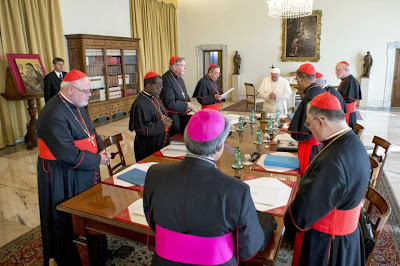 While the agenda awaiting the "Gang of Eight" was reportedly growing ever longer as the meeting approached, with the sessions set to extend well into the evenings and the members holed up at the Domus, the first indications of the summit's progress won't likely emerge until a press briefing tomorrow from the Vatican spokesman, Jesuit Fr Federico Lombardi.